When the Dutch East India company were in the process of deciding whether to establish a colony at the Cape to service and provide their ships with fresh food and meat one of their main reasons of doing so was the meat that was available at the Cape. Discoverers who had visited the Cape before 1652 had seen sheep on the shores of the Cape coastline and here and there had managed to barter with the locals to obtain one for their crews. The first sheep in South Africa are said to have originated in Southern and Central, Asia from where they migrated to Egypt and then down through Africa eventually arriving in the Cape. The sheep seen by visitors to the Cape were very big, had big tails similar to the sheep found in Syria, and also had very good meat. They were different to other sheep in that they did not have wool but hair on their backs. With the arrival of van Riebeeck in 1652 it was necessary for the Dutch to barter with the locals to obtain meat for the passing ships and the colony, as they had no herds of their own. The Hottentots who owned the sheep were given a plug of tobacco and a length of copper wire measured from the head to the tail of the sheep as payment for the sheep. Beads were also used when there was no copper wire available. Bartering with the locals for sheep turned out to be an unsatisfactory process Hottentots moved away from the Cape during the winter and took their sheep and cattle with them supplies of meat became scarce. This was of course most unsatisfactory for the Dutch as they were unable to supply meat to the passing ships. The Hottentots also after trading their sheep used to steal them back which also angered the Dutch. With the problems the Dutch were experiencing it was only natural that van Riebeeck would eventually decide that it would be better if they owned and bred their own sheep. A number of flocks were established on islands around the Cape. Unfortunately for the Dutch these sheep did not prosper because of droughts and disease and eventually it was decided to import sheep from Holland for use at the Cape. The first sheep arrived in 1657 and were called milk sheep. The Dutch used them to breed with, crossing them with the local hairy sheep and ending up with a good mutton sheep which had coarse wool. At about the same time as the first sheep arrived the Dutch East India gave some of its people at the Cape permission to stay at the Cape and farm for themselves. With this new found freedom they were also given permission to own stock and sheep farming for real began at the Cape. The Free Burghers as these farmers were known were handed a further bonus in 1695 when the VOC or Dutch East India Company decided that the farmers were doing so well with their farming that they could take over all farming activities and supply the passing ships. The farmers embraced their new found fortune with open arms and breeding of sheep continued apace. Although the local sheep now had wool instead of hair use was not made of the wool as the main reason for breeding the sheep was their mutton. Only with the arrival of the Governor Willem Adriaan van der Stel (1664-1723) did the emphasis of mutton for wool begin to change. 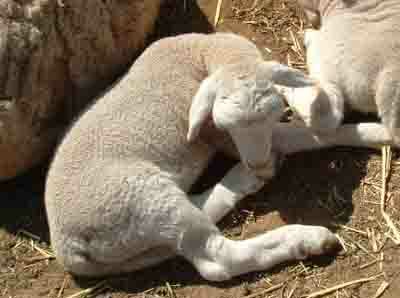 Van der Stel encouraged the farmers to breed fine woolled sheep. Spanish sheep from Holland and a woolled sheep from Persia were imported but when breeding with the local sheep began the imported breeds soon disappeared. The breeding of fine-wool bearing sheep changed drastically in 1789 when merino sheep ( two rams and four ewes ) arrived in South Africa from Holland. Up till this time merino sheep had been jealously guarded by the Spanish. The sheep that arrived at the Cape were gifts to the Dutch from King William V from his flock of merinos. Merinos were not suited to the damp climate in Holland so a few of them were sent to South Africa as an experiment to see how they would fare in the drier climate. The sheep positively thrived in South Africa but there was to be a problem. The Cape government was advised by the Dutch that the merino sheep belonged to the Prince of Orange and had to be returned to Holland. Colonel Gordon, the Commander of the Cape Garrison, was very clever, and when the sheep were returned, he only sent the original six sheep back and kept their offspring. Unfortunately for Gordon the Cape was attacked and taken over by the British shortly afterwards and he was severely criticised for his actions regarding the offspring of the merinos that had been sent back to Holland. So much so that he committed suicide. His wife who was so embittered by her husband's death decided to leave South Africa and took two of the merinos with her on the ship Britannia back to Britain and the balance of twenty six merinos she sold to ship's captains from Australia who were in Table Bay to buy produce. 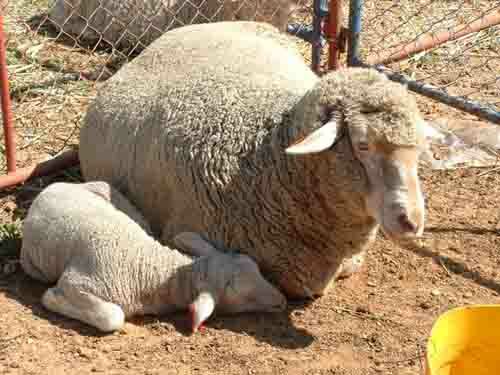 These sheep eventually arrived in Australia and became the backbone of the wool industry there. Fortunately however Gordon, before his death had sold a number of merinos to his farmer friends so the merino breed was not lost to South Africa. The farmers who had bought the sheep continued their breeding programme and the wool industry went from strength to strength. From the early 19th century sheep farming expanded throughout South Africa with the occasional dip in sheep populations due to the invasions by the British into South Africa and the Anglo Boer war. Over this period a number of new breeds such as the Dormer and the Spanish merinos were also introduced into the market. Today the main concentration of merinos are found in the Karroo. Somerset East, Cradock, Graaff-Reinet, Murraysburg and Richmond areas. With the growth of the number of wool bearing sheep it was eventually necessary to establish a Wool Commission to look after South Africa's wool industry. The commission was established in 1960 and consists of five members. Three of which are wool producers nominated by the wool board, the fourth is a wool broker and the fifth member is nominated by Department of Agricultural Economics and Marketing. Under their leadership and guidance South Africa is today the fifth biggest wool producer in the world. The contribution of wool to the South African economy is second only to the gold mines.